Despite advances in technical aspects of herniorraphy and in the medical optimization and management of comorbidities, complications following open hernia repair remain a persistent source of morbidity for the patient undergoing hernia repair. 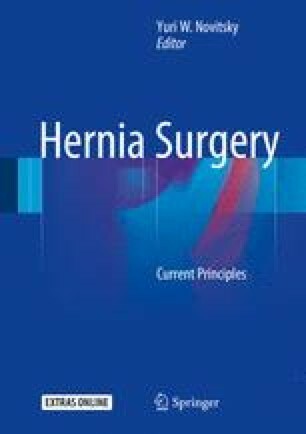 This chapter reviews the spectrum and management of complications following open hernia repair. In particular, we focus on surgical site occurrence, renal, pulmonary, mesh-related, and iatrogenic complications as these are more common occurrences in open hernia repair (especially those conducted with component separation methodologies). After reading this chapter, the reader should have a better understanding of the spectrum and breadth of open hernia repair complications and will be able to describe management options for each of these complications.